Published By – Spruce Music Co. 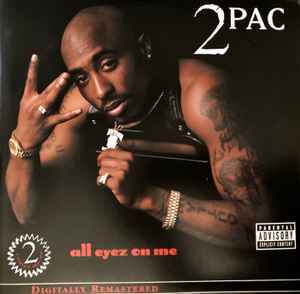 Published By – Bobcat Music, Inc.
+℗©1995/℗©1996, 2001 Death Row Recordings, LLC. I love this album and every song is a classic. Anyone else came across a 2017 European release of this album? It basically looks the same but without this "2 compact disc" or whatever thing on the front cover. I have tried really hard to like this album but after repeated listening I just can't. Such a mediocre MC at best, throw away terrible production. Sorry, I've been into hip hop since day one and I will never understand what the appeal is. My observation is that everyone I know who hates real hip hop loves Tupac, for this lp especially... figures. I've had this pressing since 2007 and have heard it many times on different equipment throughout the years. It's a good pressing. Minimal crackle/pop and I think it sounds better than the remastered CD. If you're getting skips then use a better turntable and learn how to properly set it up. I found this pressing to be absolutely horrendous after side 1. I might have just drawn a dud copy, but it basically muffled half-way through Skandalouz and fidelity never returned. A pressing using the same stampers was issued somewhere around 2014 and it blows. It drives me crazy that they cheaped out and put the 2CD flag on the album cover, but the collection sounds good so no need to really drop coin on a minty OG pressing.